This event is sold out. Please visit our other date offered on Sunday, May 19. Join us at the Wisconsin Humane Society to work on the requirements needed to earn your Dog Care Merit Badge and have a howlin’ good time! The Boy Scouts of America and the Wisconsin Humane Society have teamed up to offer this fun and informative clinic. Now all we need is YOU! 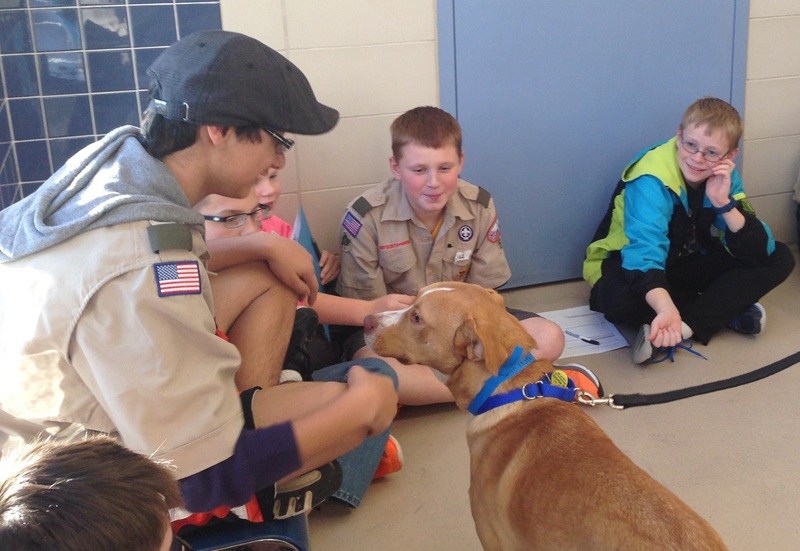 What: Dog Care Merit Badge Clinic hosted by the Wisconsin Humane Society. When: Sunday, February 10, 2019 from 1:00 to 5:00p.m. There are ten requirements for this badge, eight of which can be signed off in the workshop that day. Due to the nature of requirements #4 & #5 , you must complete these on your own. If you do #4 and #5 prior to the workshop and bring your documentation (including any photos, videos, logs) with you on the day of the workshop, we can sign off on everything that day and you are done! You can complete these requirements after the clinic as well and coordinate with the Merit Badge Counselor to get your blue card signed. Although you are not required to have a dog to attend this workshop, you must have the ability to care for one to complete requirement #4 and #5. Boy Scouts may want to attend whose families are considering adopting a dog and want to find out more about the responsibilities and care required before they get a dog. You can attend the workshop and complete the last two requirements in the future when you do add a canine family member to your pack. Are you interested in helping homeless animals in another way? Consider organizing a donation drive prior to attending this workshop and collect new or gently used towels, blankets, cat and dog toys, peanut butter and treats. Go to http://www.wihumane.org/donate/wishlist.aspx for a copy of our Wish List. Questions: Please contact Wisconsin Humane Society Youth Programs Manager and Merit Badge Counselor, Dezarae Jones-Hartwig at dhartwig@wihumane.org or 414-431-6159. The last day to register for the clinic is Friday, February 8 or until clinic is filled. Time: 1:00 p.m. - 5:00 p.m. The Wisconsin Humane Society is committed to providing protection, shelter and care for wild and homeless animals. Because of generous donors, we are able to rescue, rehabilitate and rehome thousands of animals like me every year!